Semi-live blogging of my tournaments, as I think I would better remember the hands if I wrote as I played. I maade a great fold in the first 15 minutes of the Bodog tourament, as I was dealt QQ, and after a Jack high flop that I get 2/3 pot, I was raised and re-raised. I folded, and my opponents turned over AA and a flopped straight. Was dealt AA and KK in consecutive hands, with the AA getting me 2,000 chips, the KK only 300. Managed to lose chips down to 2,200 with a pair against turned trips by Bayne. Probably should have known better against him. Sucked out big time when my JJ went up against AA, and flopped a J. The two outer for him never came, and so I am up over 5,000 chips now. Lost 1,700 of it back when a flush draw hits on the river to beat my QQ. Blinds are eating away at my chip stacks, as I am down to 2,500 chips with blinds 150/300. Push with KQsuited on a K high flop netted me 1,200 more chips, so a little more to play with. At the 2nd break, I am 11th in chips with 11 left, need to last at least one more to get tournament dollars for the next tournament. Made final table, but slow blinding out as a complete lack of any playable cards. KQo push got no callers. K10 call of PokerPeakers push flopped trip 10s and a King on the turn gave me the boat to double up. Finally knocked out in 7th, when my K9suited did not outrace 77. Also gained 1,000 chips early in the Pot Limit Omaha with AA, but lost 2/3 of it back when my flush was rivered by a boat, by Waffles! A10 < AQ, but only lost about 350 chips, and still above my starting stack. My KQ flops two pair and turns a full boat to get me above 4,000 again in the Skill Game on the last hand before the break. Very quiet 2nd hour has been about 5,500 chips at the 2nd break, in 10th place with 15 players left. A8suited managed to river a flush, and got the 2nd place in chips to call and get me over 9,000 chips. Played a few good hands, got sucked out one once, and am sitting at 11,000 chips with 6 people left, 5 get paid. Got totally sucked out by a runner runner flush by chipleader BuddyDank when I had the best hand going in to lost on the bubble. Played a live tournament at the Tropicana in Atlantic City on Sunday. $100 buy-in, and there were 40 players. My wife also played, but she went out early (about 32nd). She got only one pocket pair (Aces! ), and it got cracked anyway. I played pretty good, but probably wasnt aggressive enough early. After the 1st hour I was at 11,000 chips (we started with 10,000), and after hour 2 I was at 9,600 chips. As the blinds starting going up (every 20 minutes, and antes started at the beginning of the 2nd hour), I finally got more into the feel of the aggressiveness needed, and the stupidty of others. I eliminated two people in successive hands to take us from 22 to 20, and thus down to 2 tables. I unfortunetly was at the table with a monster stack in seat 1, and he was bullying everyone. I did double off him once, and showing pocket pairs almost every time I went to showdown, I was able to start stealing some blinds too. I ended up going out 14th when I got too cute in the big blind, and against the big stack I had 6/10 off. The flop came down 6/10/Q, and I checked my two pair. The turn didnt give much of anything so I get 3,200 (twice the blind) and the big stack called. The river brought an 8, and the big stack went all in. I really read him for trying to push me off the pot, but he turns over 7/9, and the rivered straight sends me home. Played my satellite to the $1 Million Guarentee, and was totally card dead. Only saw 2 of the first 37 flops, and unfortunetly the 38th hand was my last. I got AQo, and had already bled off 40% of my chips, I raised the blinds, and was re-raised by a very loose player. I pushed my stack in, and was called with AJo. Jack comes on the flop, and I go home from that one very early, although amazing enough I managed to outlast 289 people. The Blogger Skill Game HORSE touranment was a lot of fun, and I played well for most of it. I was actually the chip leader with 9 left, but ended up finished 8th when a large majority of my stack was lost in Stud H/L when the low hand ended up getting a wheel straight against my AAKK high on the last card. Went out shortly after that. The Blogger Big game also saw me finishing in 8th, when I really never could get things started. I was never under 4,500 chips (starting was 5,000) but never over 10,000 chips. I played good tight poker though, and was able to last until the final table. I did manage to win two $26 tokens in three attempts (and got the $14 for bubbling the other one), once coming back from under 600 chips to win my token. Love those $8 2 table SnGs where 5 people win tokens! No poker on Monday, likely just blogger events on Tuesday. Live poker is rigged. Played in the home tournament this weekend, and in the 3rd blind level I get Pocket Ace's against a very aggressive opponent. With blinds at 100/200, he bets out 600. I raise to 1800, and he says he has to call. The flop comes down Q73, and he checks. I bet out the rest of my stack (600 chips) which he calls. He turns over pocket 10s, and of course a 10 comes on the turn. Out I go, too ticked to even care what placed I finished. Came home and played two touranments, a FTOPS Omaha Hi Super Satellite and a $3 Rebuy. Played well in both. Went out on the bubble of the Super Satellite, as I got my money in with the best cards, and a two-outer on the river gives my opponent a higher straight after being behind. The $3 Rebuy only cost $9, and I finished 105th, winning me $14.95. Played great during the rebuy period, and was in the top 100 most of the night, but went totally card dead once the bubble approached at 126th, but lasted long enough to cash and try to push myself back up in chips but to no avail. Sunday has be in a satellite to the $1 Million Guarentee, plus the Blogger Skill Game and the Blogger Big Game, all while watching the AFC and NFC championships. Played some super-satellites and Monday at the Hoy last night. Did ok for the most part, I felt that I played fairly well, could still work on being a little more aggressive in the middle stages of the tournaments. Only went out early once, when my KK < 88. I did win some cash back in one of the satellites, and I won a seat in the $1 Million Guarantee Satellite on Sunday afternoon. Nothing like football and poker!! I also played the HOY, and the fantastic 6-Max format. Went up and down a lot, but I managed to finish 8th of 31 when I just couldnt the cards to win a race against any of the big stacks. It was a good time though, and I though I played well and changed my game up at times so people couldnt get a real good read on me. After a tough run and some close calls in qualifers for the FTOPS, I decided to take a run at the 50/50 last night. Took two attempts to satellite in, but I got my seat and was ready to play at 9:30. Unfortunetly, Full Tilt wasnt ready to give me any cards until about 10:15, so I never played a hand past the flop for 45 minutes, and it took until hand 37 for me to win a hand. I ended up the first hour just above my starting stack of 2,000 chips, and a little up and down left me around the same area after the 2nd hour. I doubled up early in the third hour, but was still playing very tight when all of a sudden play at my table slowed tremendously, so I looked and sure enough we were 5 from the money bubble at 153 left. While I was only at 4,000 chips and the average was nearly 8,000 I had the player to my left just using all of his time bank as we was under 2,000 chips. The bubble finally burst, and thats when I decided that now that I have made my money, lets abuse the really short stacks. I took 3 shorties out quickly and suddenly I was above 10,000 chips. Played good cards for about 45 minutes, and finally got down to 70th place, when I am at 14,000 chips, but surrounded by players with 35,000 - 50,000 chip stacks. I wait a couple of hands and have one of the big stacks bet 4,500 (blinds were 500/1000/125 ante) and I look down and have AJ suited. I pushed it, and sure enough the big stack called. He shows A10 unsuited. I smiled, for about 3 seconds. Flop comes down 10/10/K. Now I am wishing for a queen, and down comes...another 10. So I get knocked out by quads in 69th place, but I get a nice $109.10 payout. Played in an 18 person tournament, and started off pretty strong, with good reads on those players who I have played with before. The defining hand of the first level came when my pockets names flopped a set, but an straight was also available. With two other players in the pot, I bet the flop, but checked the the turn and river. When one opponent went all-in, I had to make a call on my reads on her, and I thought she was trying to push me of the pot with nothing. I called and she asked if I had the straight, and I said no, she got excited and flipped over pockets 8s for a set of 8s. I then flipped mine 9's over, and she is the first out. I was pretty card dead for the next hour, bleeding off chips when I finally got the best hand of the night, pocket Queens. I bet 4x the blind, and get raised 2x the pot, I push my queens, into aces of course. I rivered a set, but the Q gave him a straight, and I go home 12th. Learned alot on the people I played against, and look forward to playing the next tournament next month. How do you call TWO All-in with Pocket 2's? Much like Hoy's rant the other day, I am in total disbelief that people think calling not one, but two people all in could possibly work out in his favor. Mind you hit did hit one of his two outs - unreal! Much to my surprise, my wife actually was so tired last night she told me to go ahead and play the blogger events. Just got signed up in time for the Bodog Blogger Tournament. Played a little looser then usually, and have away about 20% of my stack with a flopped set that I thought was beat, so I folded to a pot sized bet on the river by two players in front of me. Ends up two pair won the hand. Managed to chip up some in the 2nd hours, but final went out on an ill-advised push with two pair on a 3 heart board, and ended up losing to trip 5's, not the flush. Either way it was a bad play, one I wish I would have thought of more before nearly instacalling. Also played the Blogger Skill Game on Full Tilt. I was surprise that 49 players came out to play Pot Limit Omaha Hi, and I ended outlasting on 10 of them when my straight on the turn gave way to a flush on the river. Now there will be no playing tonight or tomorrow, and live action on Friday. A new name for my blog, and a new start for my blogging. I have decided to give my blogging and my poker playing a new start in the new year. Everything starts over again! My bankroll progress will be started at my current bankrolls, which is $383.68 on Full Tilt, $13.00 on Bodog, and $10.00 on PokerStars. I will be blogging my poker playing every time I play, and I will even be tossing in posts about other things in life that may be causing changes in my poker playing, or just because I want to chat about it. I will still be playing my live tournaments also. With so many things up in the air in my personal life, with trying to start a family, this may be my last real chance to play in any World Series of Poker events for the next few years. Therefore my goals on Full Tilt will be to get myself back to the WSOP again this year, for another $1,500 event. I also want to play and cash in a Full Tilt Seris of Poker event sometime this year. Additionally, as most of the Blogger events are held on Full Tilt, I want to try to win at least one of each of them this year. My MATH win from last year doesnt count towards that. I realize that with concentrating on larger tournament that my bankroll on Full Tilt may take some shots, and I am ready for it and will reload if necessary. I however will follow the 5% rule (Dont buy in for over 5% of the total bankroll), so there will be some serious satellites, as my current bankroll only allows a max buy-in of $19.00. 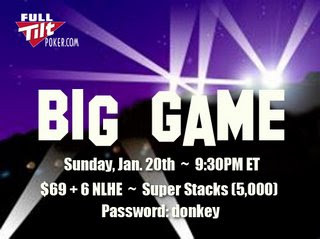 However, I have already signed up for with a Tier-2 token for the Big Game on January 20th, so hopefully I can cash (or win) that and add to my bankroll. My Bodog goal is to play the blogger event there to increase my bankroll with tournament dollars, and work it up that way. For PokerStars, I will play microcash games, and work on increase my bankroll there. I however will NOT play cash on PokerStars while playing tournaments on Full Tilt or Bodog. ONE SITE AT A TIME!!! I hope this will be entertaining for some of you, and by putting my play up here I hope to have those bloggers and readers that know this game better then me to help me become a better player. As a promise to my wife, I have told her I will not play this week much, so most likely the earliest I play is Friday night, but more likely early next week. In the mean time I will be reading Phil Gordon's Little Green Book (I have already read hsi Little Blue Book), and learning more of the game that way. I also have the WSOP home series tournament this Friday (5 events, most points in all events wins the seat). I final tabled the 1st event, but did not play the 2nd or 3rd events, so I am out of the running for the WSOP seat, but I get a 4% piece of the winner, and a chance at some side cash and valuable live experience for playing, so why not! I should have some feedback from that sometime this weekend. I will be there. I already have my token, and I bubbled last month and took a horrible beat the month before, so I am thinking it is my time. Get out there and get your $75 tokens and join in! Played Riverchasers last night, which had an non-BBT2 number of 92 players, which was amazing. Lost 1/3 of my stack earlier, but just tightened up and good solid poker. I finally doubled up when my Pocket 10s game me a set on an 4/9/10 flop, that gave my opponent two pair. A 4 on the turn game him a full house 4 over 9s, but my 10 over 4s was better, and even the 9 on the river giving him 9s over 4s still wasnt strong enough to beat me. Got some premium hands at the right times, but finally ended up going out 17th when my AKs lost to 1010 when another 10 came on the flop. As far as SNGs, I am trying the $5 turbos, but have cashed once in six attempts. The other I bubbled twice, then a 7th, 8th, and 9th (lost 3rd hand in with QQ < AA on a 2/4/10 flop). Need to play a few more to see if I am just running badly, or playing badly, but if my MTT play lately is any indication, I am just running bad in the SNGs. Time to play the Daily Double tonight, and maybe work on some more SNGs.